From the Velocity Picking window, open the General tab. Select an Inner and Outer Mute to mute the gather below and above these lines respectively. Mutes only affect the semblance and stacking calculations. Optionally, at Water Bottom, select from the drop-down list a TWT water bottom horizon that you have created (see Creating a Horizon). If a water bottom is provided, a pick will be added automatically at the sea floor. Input the Water Velocity (m/s) at the water bottom. Define the Minimum pick spacing (ms) to avoid picking points too close together. By default, this is set to 48 ms. Select the 4th order NMO check box to apply a 4th order NMO correction. At Offset source for NMO, choose whether to use the offset header or calculate offset from the source and receiver positions (SX/SY/GX/GY). Select the Stretch mute check box to apply a stretch mute to the gather. A reference velocity can be selected and displayed on the semblance. Select the volume and format from the General tab, and adjust the colour and thickness of the reference velocity line from the Display tab. If you are starting from an existing velocity, you can import it in from the Import Velocity section of the General tab. At Velocity Volume, select the velocity you wish to import. Select the Velocity Units assigned to the velocity volume. At Constrain to area, you can also select a probe or polygon to constrain the import to a specific area. 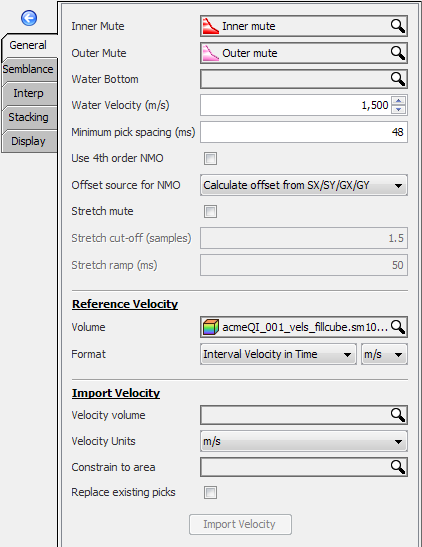 Select the Replace Existing Picks check box if you wish to replace the picks you have made with the imported velocity volume.